Retired Los Fresnos High School teacher, former mayor, owner of Keillor Construction & Lumber Inc and local historian James A. Keillor drafted his A Brief History of Los Fresnos while attending UT-Brownsville while a student in Dr. William L. Adams’ class. 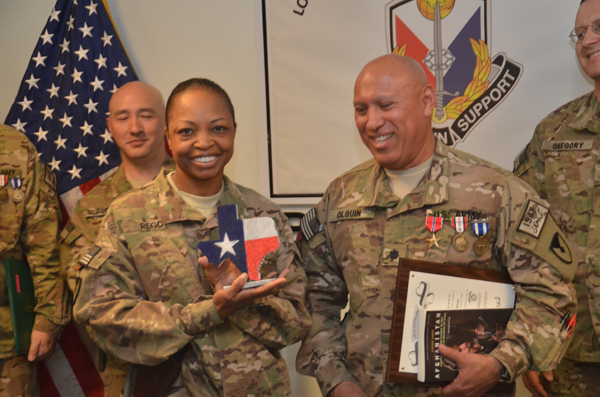 The full document can be found at the LFCISD website in the 100th Anniversary section. We present this excerpt as part of our coverage of the Los Fresnos Independent School District’s 100th year anniversary celebration. 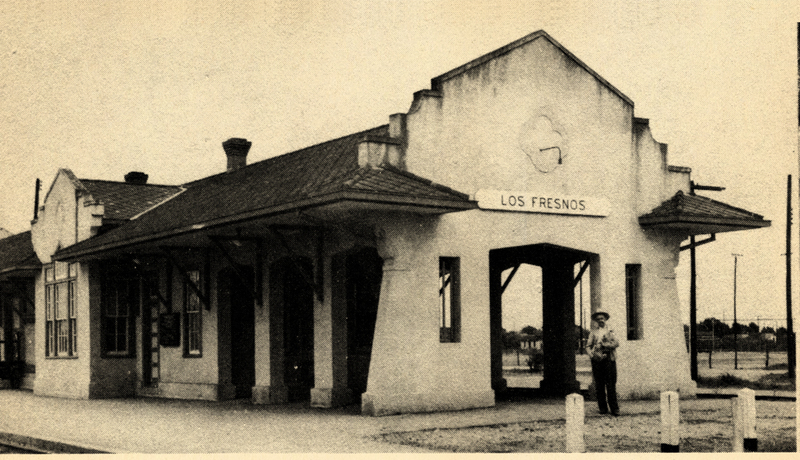 A photo from 1948 of the Los Frenos train station. The station linked Los Fresnos to the rest of the developing Valley in those days. Photo: For We Love Our Valley Home by Miriam Chatelle, 1948. Los Fresnos, a small community located in Cameron County approximately twelve miles north of Brownsville, was one of the last unsettled frontiers of the Rio Grande Valley. It was almost the last tract of land to be opened under the land company” system. The upper Valley had been quite well cleared by northern farmers by 1915 when the first settlers came to Los Fresnos.”The town grew rapidly from its beginning until the Great Depression and again during the decade of the 1940s, but has always maintained a Small town atmosphere. It is not clear how Los Fresnos received its name as several versions may be found. According to one account, it was named after the Rancho Los Fresnos established by Mexican ranchers as early as 1771. 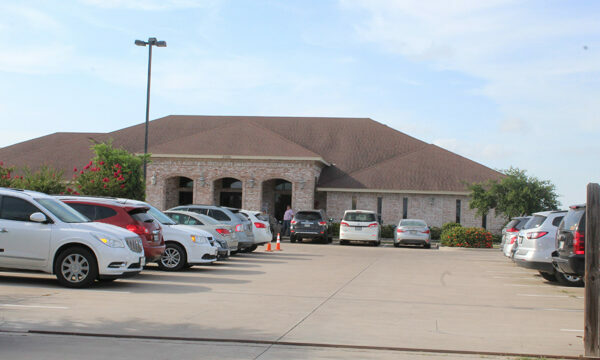 Another account tells us the proposed town was initially named Moseville by Lon C. Hill, Sr., naming it after his son, Lon C. (Mose) Hill, Jr. , but the name was subsequently changed to Los Fresnos.” However, Harry H. Whipple, an early settler who moved to Los Fresnos in the summer of 1915, states that it was already called Los Fresnos when he arrived. A third account gives the credit directly to Hill, Sr. for the eventual name. “As he rode through the senderos” (winding lanes) viewing, and planning for the future development of, this beautiful country, he saw many ash trees scattered in the woods and on the banks of the resacas”. Because of this he began calling the locality Los Fresnos – Spanish for “The Ash”. To help settle the issue one might have to look to the account offered by Juanita Zumwalt Steer, a member of the first family to settle in the new town, having arrived in April of 1915. Although I live in Santa Maria CA. Now Los Fresnos will always be my home. My roots run deep in Falcon territory. Sitting with my mom and aunt who grew up in LF. They remember many of the above people that replied. Their maiden names are Sue and Donna Nixon. My grandmother also grew up in LF, going to school there. Her maiden name was Dorothy Sanders. I have wonderful childhood memories of my visits to LF. Born and raised in Los Fresnos, I moved away in 1985 I’ve visited my family they still live there. Go Falcons!! My parents roots ended there and my roots and memories are and will always be there. Great history lesson of the best small town in Texas. I have lived in many places throughout the US. This is one of the most corrupt towns in South TX. What a nice article. I did not know a lot of history about Los Fresnos but have many fond memories of growning up there. I now live in Wichita, KS. I love history to begin with, I have in the past tried to research the history of Los Fresnos, Texas Falcon territory but did not find much information. This has always been my home and I have great memories of days gone by. The people are great! the schools were and still are the best in RGV. It is a great place to live. I remember checking out Mrs. Chatelle’s book when I was in elementary school, while Mrs. Chatelle was our librarian. Does anyone remember her? That would have been in the late 60’s or very early 70’s? I remember the book talking about a bad train wreck near Olmito. My buddy and I would go rabbit hunting in the sugar cane fields all the time. Bueno, God Bless Everyone! Go Falcon’s ! ! ! I was born and raised in this small community by my mother Eustacia (Tacha)Huerta. So many fond memories of this small town which Im proud to call HOME. My mother worked at Frankies Café which was located at the corner of Hwy 100 and Paderes Ln. My mother’s home was one of the first home built on West 2nd Street by Keillor Construction and to this date is still solid. Los Fresnos has grown a bit but in my opinion still has that small town feeling where everyone knows everyone. You cant go into Wal-Mart without running into someone you know. I Love it. I was born in 1952 in a very small community of laurels just north of Los Fresnos. Though I now live in San Antonio I will for ever call Los Fresnos my home. It’s were I grew up and went to school. Our elementary, Jr High and High Shool were on the same campus. We all shared the same cafeteria, gym, football field and the same shool buses. I rode bus #6 and Mr Librado Gonzalez was our bus driver for the 12 yrs I was in school. I still have my mother 3 brothers Herman, Saul, Rick and my sister Mary who still live there. Growing up we knew everyone by name. We only had one police. Mr Ed Moody and later Mr Cantu. Growing up in Los Fresnos was always an adventure we could hunt pretty anywhere and fish all the camels and resacas. Every summer was so busy working the fields, there was plenty of vegetables to pick and cotton. We were poor but we didn’t know it because everybody had the same lifes. Those truly were the good old days. Just because you left Los Fresnos, doesn’t mean your heart ever did. And thank you for the great article Mr Keillor.